Some of the newer bowling alleys are catering to kids! Host your next party here for some built in entertainment. Even a toddler could bowl with the bowling stand. They have help placing the ball on the stand, push the ball with two hands from behind and it rolls down the stand into the lane. they place the ball, Kid friendly gutter guides keep all balls from becoming a frequent gutter ball so even the first timers had a wonderful time. One of your easiest places to find is at Celebrate Express. From balloons, to plates and favor boxes, invitations and more. We saw these cute invitations at Celebrate. You can stil opt to decorate the tables with a theme tablecloth and paper products. You can find some balloons as well! Or for a complete Party Pack, take a look at these! Some bowling alleys will require you to buy their food and in this case it was pizza. You can bring the cake and paper products. Many times the cakes aren't bowling related but are featuring a favorite charactor or sport. You can also have matching paper goods to match the theme of your cake. 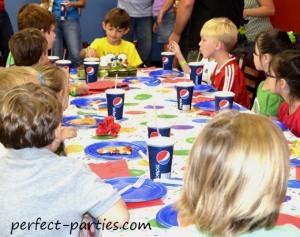 Favors can also be a chosen theme rather than just bowling. 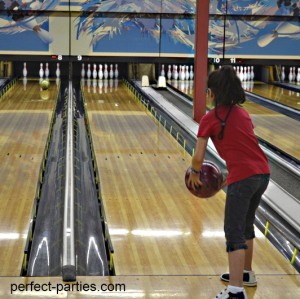 Bowling will of course be your main event but some bowling alleys offer arcade games or even a bouncy area for younger children. One of the things I liked about this hosted event was having all the children participate, they were centralized in four lanes, two groups of chairs side by side. Flat rate fees are offered which include the game, rental of shoes. Remind children to bring socks on the invitation. Have the shoe sizes of all the children prior to the party. They can have shoes laid out ready. This goes much faster! Ask who or where the presents brought will be collected. Be sure to factor in some time if you want to decorate with balloons, special table cloth and favor bags. Check to see what's included as far as food and what items you are allowed to bring.